Two maybe, just maybe, slightly less intense Laphroaigs. We know the rule of thumb that the more time a peated whisky spends in the cask the less peated it will be, ceteris paribus. There are exceptions of course, and now and then you get a cask that’s a peat monster after 30 years, and the cask that scrubs out the whisky clean after 10 years. 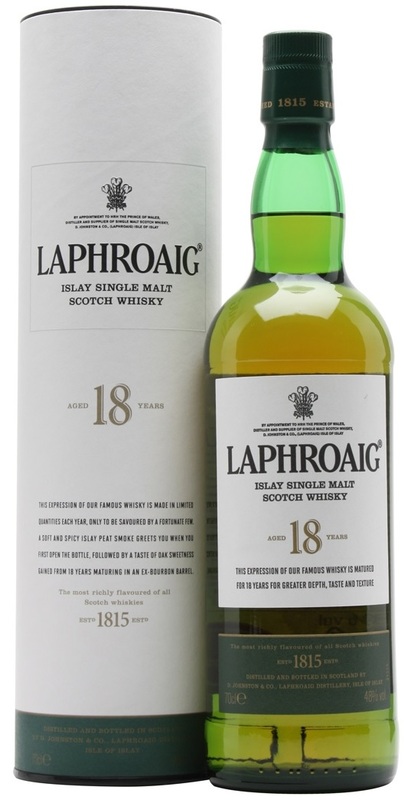 Laphroaig 18 was first introduced in 2009 to replace the blue-green (I really liked that particular colour they used!) tube 15 year old. That 15 was itself the sucessor to a line of excellent 15s. In 2014 they changed the presentation of the 18 again, and the older blue-green tube 18 with the distillery sketching in an oval icon became the white tube, 2 piece label bottle. And then what goes around comes around and 18 is now discontinued for a new 15 year old. At the time the move to an older expression was a bit puzzling given how distilleries were running out of aged stock and/or premiumizing their slightly older stock for special releases with special prices. One can only speculate perhaps around the mid 90s Laphroaig had cut back production severely, and then ramped up to full production by the turn of the millenium. Or maybe a lot of the stock from those late 90s years were sold off to raise capital for some other part of the business. We do see a lot of 96-98 Laphroaigs issued by independents don’t we? Careful stock management then allowed the issue of an 18 for some 6 years? Please note this is pure speculation. The version being reviewed here is the newer 18. The second Laphroaig is the Friends of Laphroaig special hence its name, Cairdeas being Gaelic for friendship, and was issued to celebrate the FoL’s 18th anniversary in 2012. This batch was apparently the leftovers from the first Cairdeas, left to mature further and then blended with younger whisky which had spend some 7 years in quarter casks. Nose: Actually. It’s not light at all. 2 things at once, Laphroaig’s iodine and salty seaweed tang, but also a big syrupy sweet toffee sauce, cooked apple sauce, vanilla and oak sweetness. Burning grass, smouldering cedar, carbolic soap. Much in line with the name on the bottle, and I suspect a large proportion of first fill Maker’s Mark, yet none of the huge intensity as the cask strength 10, and in fact much more flabbily sweet to me. It’s quite drinkable yes, but ohh.. the old 15… Someone else might love this though. Palate: As expected, smokey salty medicine greatly tempered by spoonfuls of sugar and lashings of wood. Really not bad at all. Lots of sweet notes mixed with the gentle menthol, add spiced. Not a huge body or forboding in any sense, but neither is it an improvement over the old 15 unfortunately. Finish: Long, seaweedy, vanilla and wood notes. Rather good, and therefore somewhat lacking. For to be a Laphroaig is to carry an expectation of greatness. Err.. Did that sound grandiose? Nose: Much cleaner than the 18, more on lemon and wood ash. But also less overtly smokey and peaty. Tuned down, not out. This one has more of a ground up sea shells, muddy seawater, wet ropes maritime feel to it. Less hugely sweet as well. More of a herbal bitters medicine rather than pure iodine. Less evident wood, but its there. Very good. Palate: Lemon and woodash in seawater. Sand and calcium carbonate. At the risk of saying more herbal bitters, I’ll try .. Wintergreen, dill, camphor and disinfectant? Something like that… Simple, sharp, maritime, tasty. Finish: Long, ashy herby theraputic. This I like a lot. Ok so not the heaviest Laphroaig, and yes it’s fairly sweet, but remains well focused without the messy fresh bourbon. 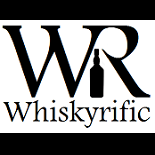 This entry was posted on February 28, 2016 by Whiskyrific in Laphroaig and tagged Laphroaig.